Harry (Apex, NC, United States) on 19 March 2019 in Landscape & Rural and Portfolio. Not many miles down the road, we parked beside a well tended field with some barns and sheds. My fellow explorers headed right to them, but I headed down a short hill to this small pond. what a beautiful image here ! I love this blue water...the reflecytion of the dku and the reflection of the trees here ! What a strange presence the trees seem to have . .
A gorgeous picture with beautiful colors. I think you made a great discovery. Nice shot. You found so photogenic scene. 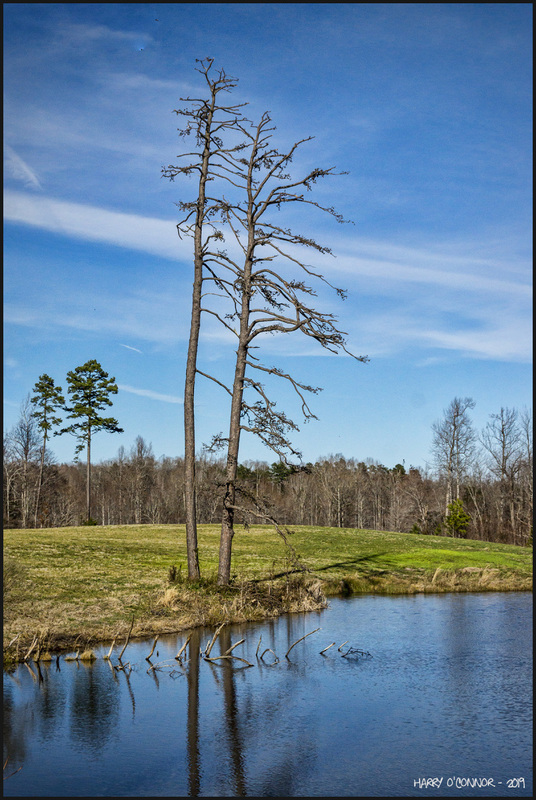 Beautiful photo of the tree near the pond and superb composition. These are two sad trees, but a beautiful composition. How interesting that the branches all exist on the right-hand side of the trunks! A nicely-layered composition between the two refreshing blues. I'm glad you took the road less traveled.... these make a lovely photo!